As dog lovers and owners, one of our main concerns is going to be keeping our furry family members around for as long as possible. We want our dogs to grow old with us and have a happy, healthy life. Much like us, as our dogs mature, they require more and more support for healthy joints and an overall healthy body to maintain mobility and longevity but do you know your dog’s real age? Dogs age differently to us and therefore can have different needs at different stages of their lives, so knowing your dog’s real age can help you with how you care for them and provide the necessary diet and supplements needed. 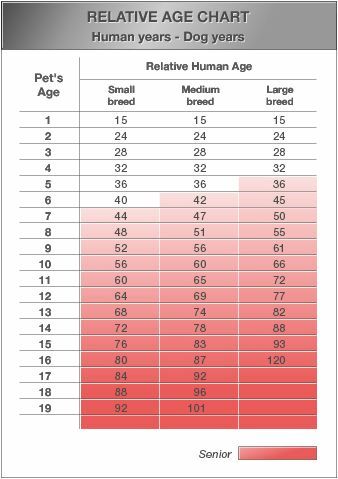 Your dog’s real age can depend entirely on their breed and size and once you know this, knowing what your dog needs is then the first step in keeping them in the family for years to come. 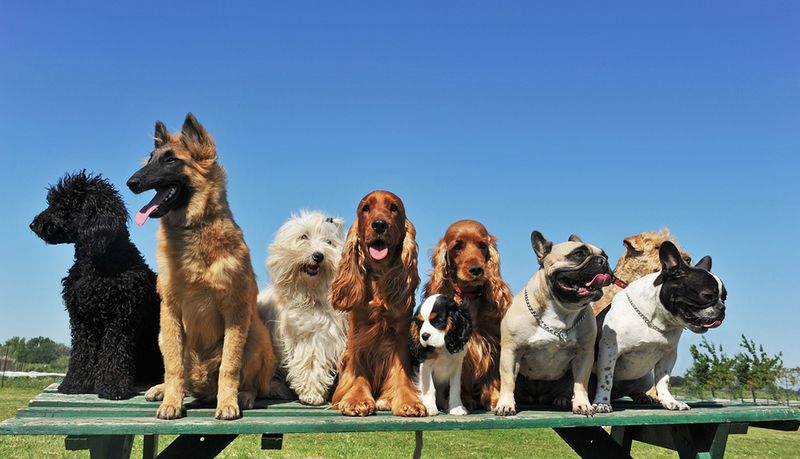 Regarding your dog’s real age, have you heard the common saying that one human year is equal to seven dog years? Well, this is completely untrue! In fact, dogs actually mature more quickly than we do very early on, and then ageing slows from there on depending on the size of your furry friend. For instance, in the first year of their life, a dog’s real age is equal to about 15 years, give or take, and then the numbers begin to be less similar after their 5th year. You can refer to this chart as a good guide for a 19-year representation of the conversion of years by the dog’s size. Unlike differences in ageing based on size, with breed it’s slightly different. More accurately, breed has to do with determining what health complications they are more likely to develop as they age. For instance, the Labrador is predisposed to hip and elbow dysplasia, due to growth rate differences in the bones of each, which can lead to arthritis and other joint problems. The Pug, however, has a predisposition to conditions such as Progressive Retinal Atrophy and Pigmentary Keratitis, both of which are diseases of the eye, and can cause blindness. While not all dogs have a predisposition to the same health issues, none are exempted from the general degeneration of their bodies as they mature, and we should take particular care to ensure they age as well as possible to keep them happy and healthy as our lovable furry friends become mature dogs, and eventually senior dogs. As previously discussed, dogs age differently based on their size and due to this, their nutrient requirements can change as well, so it’s extremely helpful to know what changes to expect as your dog matures. All dogs are considered Puppies from birth to 12 months of age, although some larger breeds are considered Puppies until 2 years of age due to their continuing bone development. Toy/Small dogs (less than 9 kilograms) – Reach maturity around seven years of age. Medium dogs (10 to 23 kilograms) – Reach maturity around seven years of age. Large dogs (23 to 41 kilograms) – Reach maturity at around six years of age. Giant dogs (excess of 41 kilograms) – Reach maturity at about five years of age. Also, as your dog matures and health or joint issues develop, they will move around less, requiring you in some cases to feed for mobility health so they can get back up and be active with you again, feed them less or on a reduced fat diet to maintain a healthy weight. What is also interesting, is that while some brands of dog food market their food specifically for your dog’s age, mobility and your convenience (among other things to make it easier for us), other brands believe that due to the fact that dogs developed into the family members we know today from the wolf originally, their food needs to be based on the same diet which has the correct balance of vitamins and minerals required, regardless of age. This is because when wolves hunted and then ate, all the wolves of the pack ate the same, regardless of age. While their food will play a large role in whether they are getting enough of each and every nutrient they need, sometimes other factors come into play. For instance, older dogs sometimes eat less as they age due to change in appetite or health conditions such as oral disease, and supplements can help make up the difference. There are a number of supplements available for joint health including those suffering from arthritis or other joint problems. Something else you can look at is whether you believe your dog is receiving adequate amounts of vitamins and minerals from their diet or happens to be on a raw food diet. Adding a supplement can help you continue to provide your dog with a well-balanced and healthy option. So you can see, knowing your dog’s real age is important because as your dog ages, there can some aspects you may need to consider that can help your dog maintain a healthier and happier life through the correct nutrition and/or supplements. Feeding them based on their age can include their current level of activity or their increase in weight as a possible result. Either way, the right help if needed, is never too far away. This entry was posted in Food, Health, Mature, Puppy and tagged Arthritis, Blackmores, Complete and Balanced, Hills Science Diet, Ivory Coat, Joint Pain, Large Breed, Mature, Meals For Mutts, Natural Animal Solution, Puppy, Senior, Supplements, Ziwipeak. What Really Does Complete Balanced Dog Food Mean?